Your sprinkler knows when to water, but does it know when not to water? What makes the water in your landscape evaporate? Different weather conditions cause water to evaporate faster or slower. Controller Link will water your landscape by collecting current weather conditions, taking the guessing game out of, "When do I water?". Use Water wisely by watering according to plant and landscape needs. Get the right amount of water needed to be healthy. When Controller Link waters according to current weather information you can save 30% or more on your water bills. Imagine what you can do with money saved from your water bills. By using the internet, Controller Link gets current weather data that is specific to your location. No need to water in the rain again. Controller Link determines the rate of evaporation from the soil, giving the optimal amount of moisture for healthy lawns and gardens, cutting down watering during low evaporation. 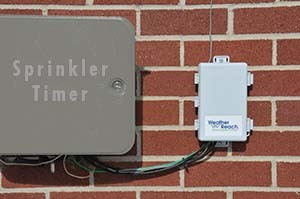 Controller Link is a simple upgrade for your existing sprinkler timer to provide weather based watering. With DIY easy installation instructions and supporting videos, your Controller Link can be up and running in just a few hours. Not the DIY kind of person, find a qualified contractor in your area, or contact us for a complete list of professionals in your area to install your Controller Link. Manage your sprinkler controller from any smart phone, tablet, or computer with our remote management tool. Sign up for Weather Reach Access (an optional subscription) and get remote management to your sprinkler system. No, climate controlled irrigation is simpler, more cost effective and reliable. Weather sensors track evaporation. Weather Reach Smart Irrigation Control products know when to water. The science behind climate controlled irrigation has been used reliably for decades. Advances in technology bring the benefits climate controlled irrigation to homes and businesses. Yes. The soil is a reservoir. The soil moisture holding capacity is based on soil type and root depth. 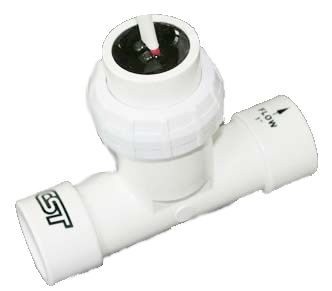 The optimum irrigation amount set in the Controller Link is based on the soil holding capacity. The Water Management Simulation can help you see the relationship between soil type, rooting depth and the best way to water. In markets with public weather stations there is no subscription for the data. Commercial providers require a subscription to get data from their weather station network. Weather Reach Access is an optional subscription-based service recommended for those who need remote management. Find a Distributor or Contractor. Controller Link supports Irrigation Flow sensing, and combined with Weater Reach Access Remote Monitoring you can stop the flow before major damage occurs. Get more information on Weather Reach Access. This product has earned the EPA WaterSense® certification and thus displays the WaterSense label. It has met the strict standards of the EPA protocol through a third-party testing agency by demonstrating that it manages the use of water more efficiently while performing as well as or better than conventional models.